Save yourself from the clutches of alteration! 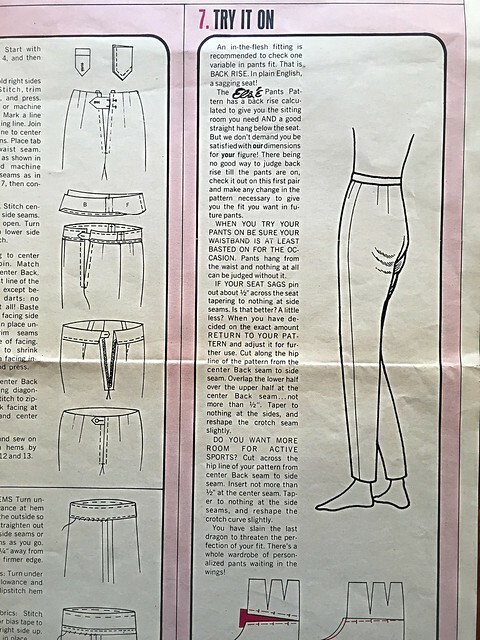 Do you ever look at vintage patterns just for the instructions? Perhaps this just shows how deep into sewing obscurities I can delve but my obsession with all things sewing related leads me to purchase completely unnecessary yet interesting vintage (or semi-vintage) patterns. Some small detail or appealing illustration can be enough to draw me in. As long as the cost is minimal - and most of these patterns are found at various sales among bins and bins of old patterns for any price ranging from pennies to a couple of dollars. Which brings me to this pattern I found at a recent ASG stash sale. If you have the opportunity to paw through the stack or bins of old patterns it becomes apparent just how many pattern companies there have been, some still succeeding, some disappearing without a trace, others being absorbed into a bigger entity. Today's independent pattern companies are carrying on a long tradition of sewing patterns and often creating something to fill a particular niche. This pattern caught my eye and when I got a chance to look through the instructions they did not disappoint! When you read criticism of literature, they often mention the writer's voice. 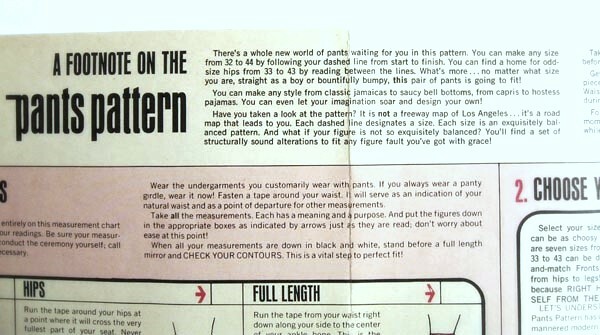 There is no mistaking that the author of these pattern instructions had a very specific voice - which might seem a bit dated but is very entertaining and include some very apt admonitions as well. 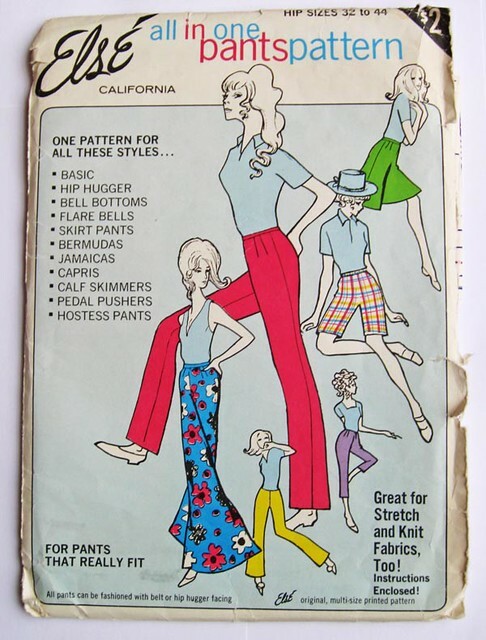 Else of California pattern, copyright is 1968. On the back they manage to give the fabric requirements for all sizes for every one of the possible options. Who doesn't want a pair of Flare Bells in their wardrobe? Now we get to the entertaining part, which is not really part of the sewing or fitting instructions, but what struck me as more like editorial comments sprinkled throughout. "There's a whole new world of pants waiting for you in this pattern...What's more...no matter what size you are, straight as a boy or beautifully bumpy, this pair of pants is going to fit"
bumpy? that's a new one. "Don't try to conduct the ceremony yourself, call in a close-mouthed friend and swear her to secrecy, if necessary"
No, wait. This part is my favorite. "RIGHT HERE IS WHERE YOU CAN SAVE YOURSELF FROM THE CLUTCHES OF ALTERATION!" I like that idea - being saved from the clutches of alteration. Someone should use that if you are writing a sewing book. Most sewing books are so cheerful and upbeat in a way that is perhaps a teensy bit unrealistic (cue ironic smile here) After all, fitting/pattern adjustment is kind of tricky. And perhaps should be acknowledged as so a bit more often. Although I do have to give a shout-out to some of the Sandra Betzina sewing books, I have a few of her older ones, I think the Power Sewing series and she is so matter of fact about fit issues, what most everyone wants to highlight or obscure. A very rational point of view. Anyhow, apparently Else of California can save us from the CLUTCHES OF ALTERATION! I love that phrase! and now will try to use it in regular conversation, to confuse my friends. Here's the helpful diagram which shows how to get all those variations from this one pattern. Talk about a good value. Which again illustrates my frequent point that there are no new patterns - or very few new patterns/pattern ideas. 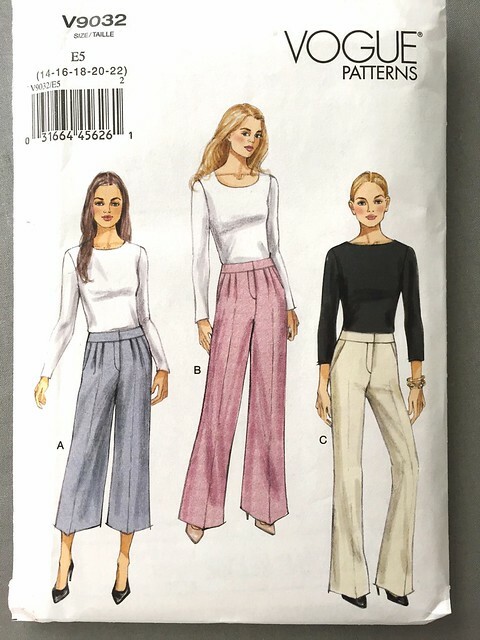 I do like how they have both a high waist with waistband or a lower cut pant option in the instructions and suppose you could modify with zipper placement, pockets etc to get all kinds of looks out of this pattern. 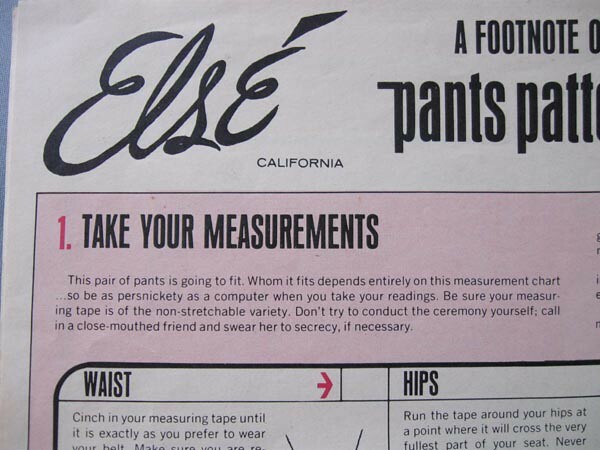 The fitting instructions are good, I would say they are like a condensed version of the entire Palmer and Pletsch Pants fitting book made to fit on one page which is clever. And sprinkled throughout are more crazy tidbits about hip pillows, baby darts and other fit adjustments that I have never heard of. (or never heard with those titles). Lastly we come to the most important pants fitting conundrum - the saggy seat. Which Else has helpfully illustrated with this poor women who despite appearing quite trim and shapely has the dreaded baggy bottom. But Else has a solution. I did get a few tips from her instructions so hey - most anything is worthwhile if you learn something new. The pattern pieces have been mostly cut down on the size 38 line (shame on you, non tracer of patterns) so not really useful for me, perhaps I will do a pattern giveaway on this one. But I think I have learned enough from Else and added a new zingy phrase to my vocab (clutches of alteration-ration-ration, now I hear it in my head with that movie echo effect). Plus I have made an actual wearable totally satisfactory pair of pants using Vogue 9092 and it was not ALL THAT BAD! you have no idea how annoying I have found pants recently. Fitting pants sewing patterns, I mean. I have no trouble buying pants - they seem to fit perfectly fine if I buy them, but sewing fit has eluded me until now. Will try to take some pics this weekend. Lots of sewing to do this weekend, I am in the midst of another version of this fantastic Burda dress for my friend Heather and I want to make a silk blouse for myself because the fabric is burning the proverbial hole in my pocket. Does that analogy apply to newly purchased fabric? I think so. Halloween on a Saturday night, clear warm weather. Talk about terrifying! Mine is a very trick-or-treat favorable neighborhood and it so much fun to see the cute little ones that start as soon as it gets dark, and then exhausting by about 8 pm when the ridiculous almost-teenagers are showing up. On the plus side, each year one of my neighbors holds a sort of cocktail party on their front lawn - so we all close up shop, dim those porch lights around 9 and head down the street for some much needed iquid refreshment. Do you know that phrase "be careful what you wish for?" I'm sure you do and I feel that sentiment lately, as I always wish for summer to last all year. However - my sewing mojo has completely disappeared and I attribute that to the lack of autumnal weather. Looking back on the past few years I always seem to have some post in October mentioning how we haven't started wearing jackets or boots but this year our forecast has been extra balmy. Feels a bit Los Angeleno, eek! 80's˚F most every day and I am actually getting a bit tired of it. even though taking an after dinner walk wearing shorts and a t-shirt is very pleasant. Oh well, check back in January when I am complaining about our admittedly not polar winter. Note for travelers - so many microclimates here in the SF Bay area so check before packing your suitcase, you could find yourself shivering as you admire the Golden Gate if you don't bring a bit of everything. Anyway - that is a long way round to say that I feel like I have quite a few fall or winter coats and jackets, so even though I love to sew them I just can't get motivated. Recently I bought some silks so I think this fall will be a festival of shirts and blouses. 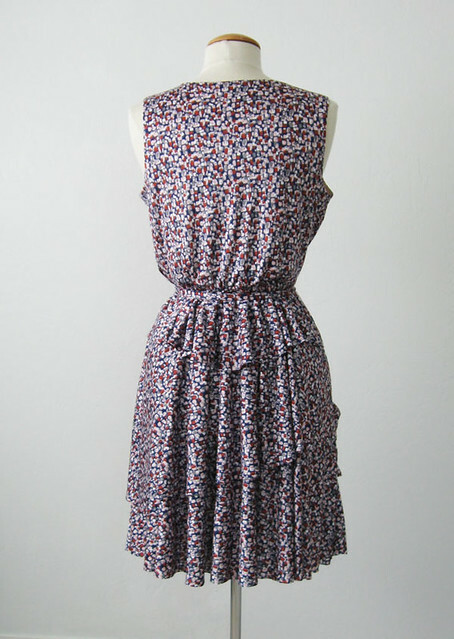 Apropos of nothing: I am mildly obsessed with this Marfy dress pattern that I happened to see on their website. Talk about out of season! now that fall is approaching (sort of, see paragraph above). Anyway I am a sucker for a white dress and I can see that exactly as they have pictured, with the ribbon trim. Maybe I will order the PDF and put it away for spring. I had such good luck with my previous Marfy pattern - something about their proportions is very very good. Italiani e la moda, sanno quello che fanno. (they know what they are doing :) By the way they have some links on their website to sewing videos, I watched this one all the way though. While I do these pockets all the time I was kind of mesmerized by the person doing it - with no markings or tailors tacks. And as in the couture houses I have seen on various documentaries, the person sewing is wearing what looks like a white lab coat. I like that touch - maybe I will get one to up my sewing game. 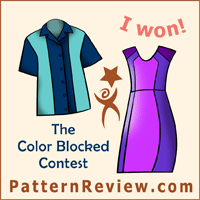 Searching for something new: Not sure I am planning to enter but I saw an upcoming contest on Pattern Review titled "New to me pattern company" and thought that was a fun idea. So I have been looking....and looking, with nothing jumping out at me that I want to try. 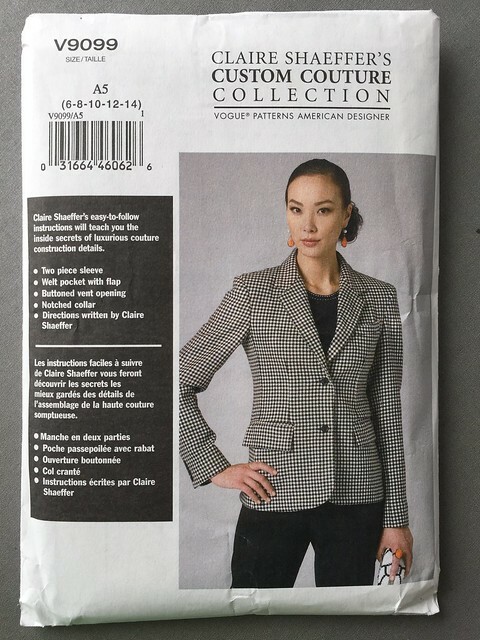 I was looking for an interesting jacket pattern, and I have already sewn Burda, Pauline Alice, StyleArc, Marfy, all the big US ones, even once made a Grainline pattern. 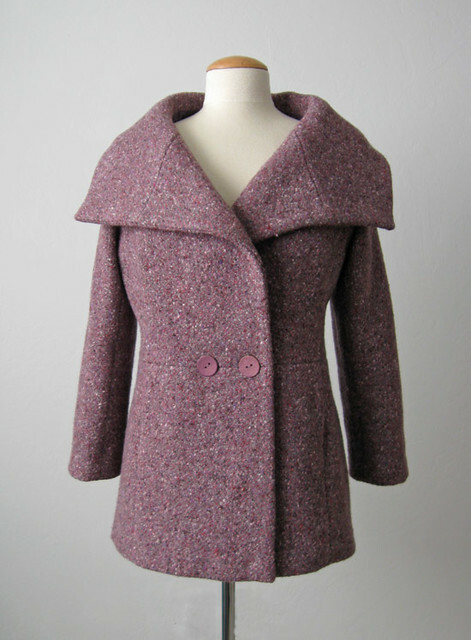 So a new to me pattern company with an interesting jacket - so far nothing found. I saw a shawl collar jacket pattern from Waffle patterns but it didn't really thrill me or seem much different to what I already have. Any ideas? I might have to try a blouse or shirt. Flat Pattern Measureing: Do you do it? I read a lot of posts where someone has sewed something by choosing a size but didn't look at the finished measurements or measure the pattern. My advice - do it. 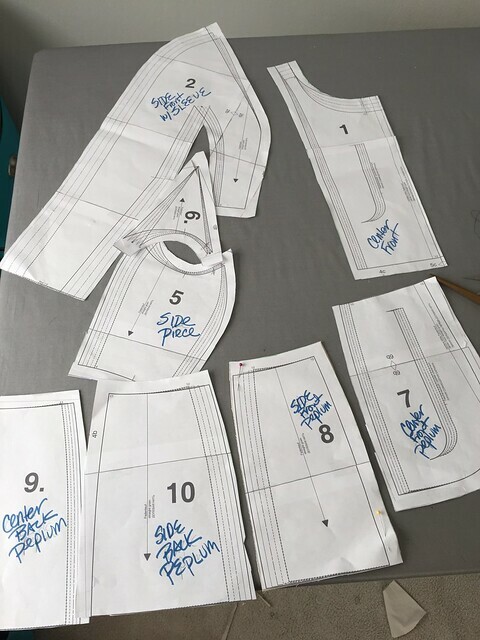 See below, the finished garment measurements are printed on the pattern but if they weren't you can use the measure tape, be sure to omit the seam allowance if it is on the pattern and then add front and back to get circumference. I saw a lot of questions on some knit patterns recently about finished garment measurements and negative ease. If you are really questioning, mark out that number with pins on your chosen piece of fabric and then wrap it around, hips, bust, whatever area you are concerned. If you like how that fabric feels at that circumference then great but if not alter, or find a different fabric. I think doing a bit of testing your uncut fabric, draping it over your arms, or wrapping around can tell you a lot about how it will look as a finished garment and save some time and/or money by helping select the right fabric. 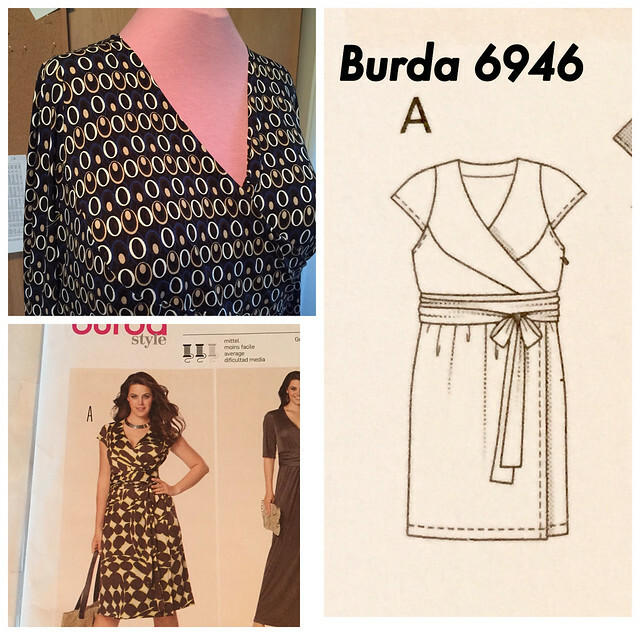 Burda Plus envelope patterns: There are a lot of hidden gems among the Burda Plus patterns, and particularly in the envelope patterns. (actually I also think there are some good ones in the Simplicity plus patterns too). For many reasons a lot of Big 4 or indie patterns don't include all sizes and I think with a bit of searching you can find a lot of silhouettes in Burda that can be varied to emulate some of those patterns. I can't speak for all figure types but Burda plus patterns seem to have the proportions more right than others, in that the shoulders do not get so wide along with a larger bust. Anyway - just a little love from me for these patterns - I have used them for various people with good success. 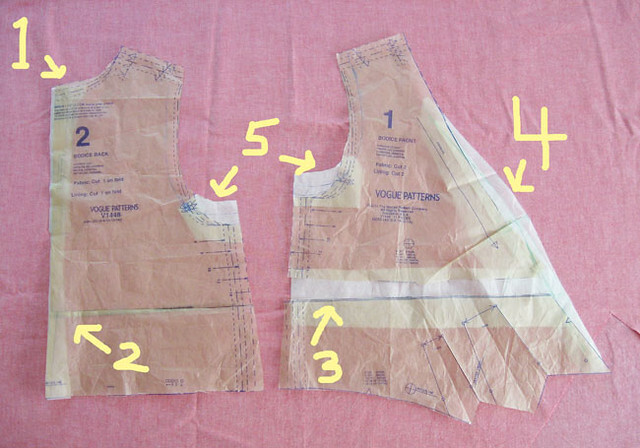 Also I love a multi-size pattern, so easy to grade between sizes for top half/bottom half, sleeves etc. I am now in the process of sewing this pattern for someone and it is really nice. I did adjust the neckline slightly for more coverage but will show all the pattern alteration details in a post when it is finished. 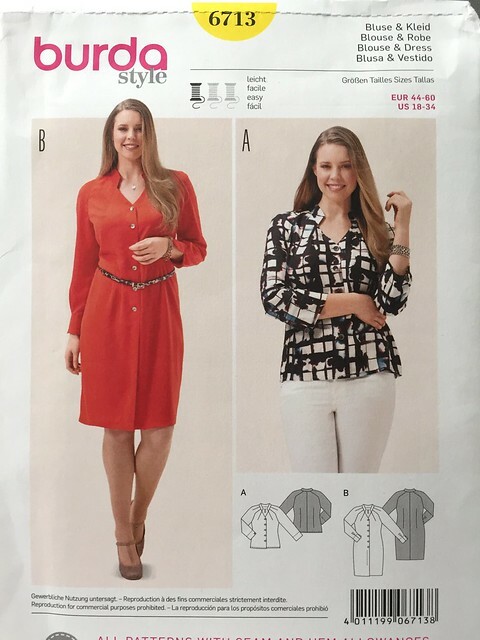 I also bought the Burda 6713 blouse pattern, which also shows it as a dress. I like that Burda finds ways to create interesting details with creative necklines and dart shaping. Investment in Sewing Tools: I saw a great post by Karen of Did you make that? the other day, about which sewing tools turned out to be very good investments for her. I agree wholeheartedly about the wooden clapper, and I have waxed lyrical about the benefits of high quality interfacing many times. (My fave is from Fashion Sewing Supply, all the different types they sell, and I just noticed a sale on now ,15% off, I will be stocking up on the ProSheer Elegance and ProTricot deluxe). She also mentioned buying and loving the very expensive invisible zipper foot, which seems like just the thing for a lot of people. In the comments quite a few mentioned that zipper foot plus the walking foot. I wonder if that is a Bernina thing? A machine I have never tried. As I have mentioned probably ad nauseam the machine I use for anything fussy is my Slant needle Singer 401 with the sliding zipper foot, here is a link and post with details on using that foot. I have so many interesting feet for my vintage machines, they are incredibly well made. However the only ones I use are the zipper foot, the buttonholer and once in a while the ruffling foot or the pleater. I have never quite mastered the narrow hemming foot. To tell the truth I forget about them and just plow ahead with the standard one - so far so good. 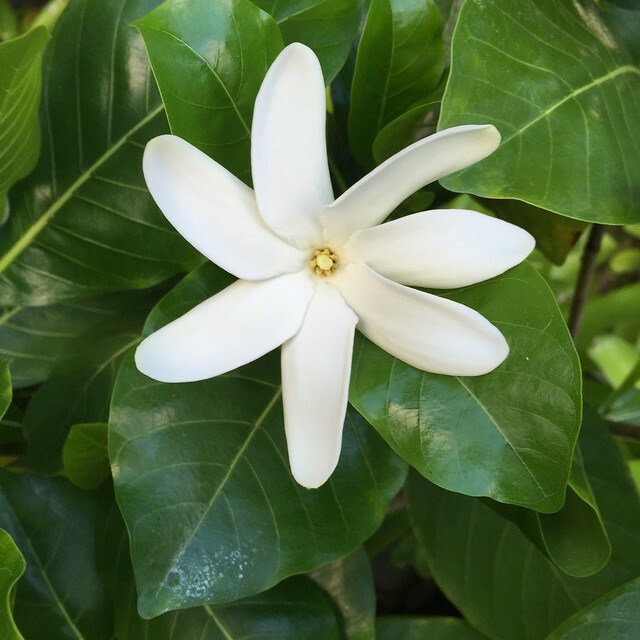 Why reading blogs is good for me: I have very fixed ideas about what looks good, what is the right fit, colors I love or hate, styles that are gorgeous or ridiculous and thankfully everyone else in the sewing blogosphere does not have the same point of view. Wouldn't that be a boring world if everyone had the same taste? What I am trying to say is there is a lot of stitching available to view that are things I would never choose and that is a good thing. I see colors that I don't like but realize that someone else has picked a perfect shade for their own look. 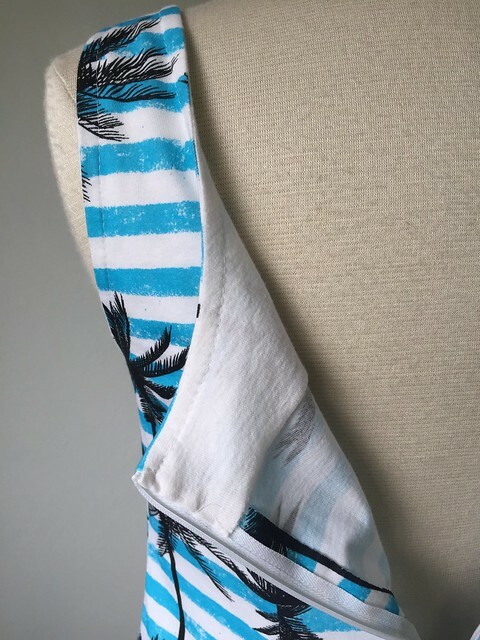 I see patterns that appear crazy or shapeless or difficult to wear and come across a blog post where someone has paired that pattern with a fantastic fabric and created something beautiful and unique. I see techniques that I can't be bothered learning but find amazing and so creative. Sewing blogs (and the related websites, instagram, etc) have really helped me view fashion and sewing in a different way, all to the good. I probably won't be dyeing any fabric, or adding grommets, felting, embellishing or otherwise manipulating fabric but I have a growing admiration for everyone who does those things. Thinking about when I learned to sew and remembering that my only audience was my family and school friends gives me a greater appreciation for every new sewer that picks out a pattern, gives it a try and posts their creation - often baring their soul regarding fit, body issues and their feelings about clothing and appearance along with their sewing triumphs and failures. I wonder if I would have been quite so willing to share my early attempts. As for recent attempts, I am trying another pants pattern (pants are my achilles heel, my white whale, my pot of gold at the end of the rainbow) In other words, I am never satisfied at fitting myself with pants. 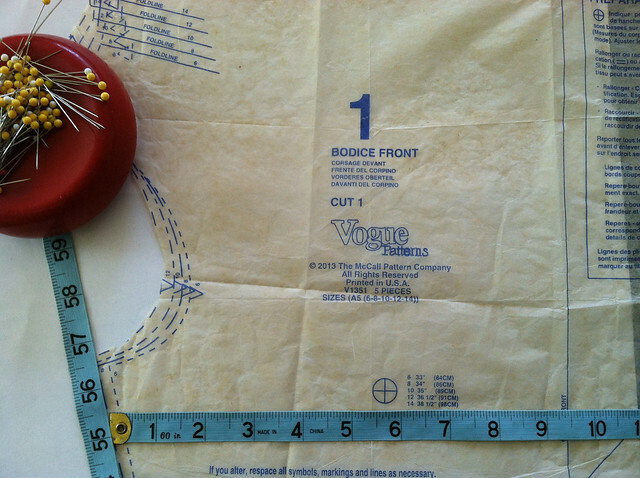 Anyway, giving it another try with this Vogue pattern, which has back princess seams. There are a lot of good versions to see so a girl can dream, right? I will report, if not model. another garden photo remaining from my vacation, in a somewhat autumnal color scheme. 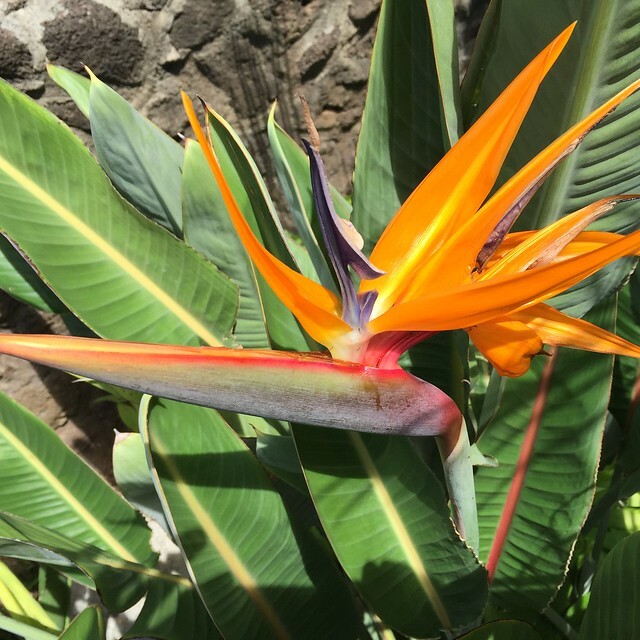 I see these Birds of Paradise growing around here in my neighborhood, even though they are a tropical plant. Just have to find the right spot where they never freeze. One of these years I will give it a try. Saved by the muslin! If you do make muslins of new patterns you will know this exact feeling. I saw this pattern a few weeks ago and thought it was just different enough to add to my jacket wardrobe. Interesting details and new shapes keep my interest, sewing-wise. And I don't really want to wear the same jacket over and over, no matter how much I like it. I already have 3 jacket pattern repeats in my wardrobe so I wanted something new. Here is the link to the BurdaStyle page, it is 04/2015 #116 so just released late this past spring. Back to this pattern. A few years ago I had a green cotton coat that I bought on a whim one rainy day when shopping at Macy's. It was really cute, trench coat style, nice buttons, belt, buckle details. But it hung in my closet because every time I put it on I fixated on the weird round shoulders. Which this pattern has as well. I operated on the green coat - tried to reshape the shoulder but it never was quite right so off it went in the donate bag. But this muslin below, when I put it on I just felt like I should be part of the crew of Starship something or other. I did sew this test version up using a canvas type fabric I had in the stockpile - vaguely recall buying it at a yard sale or something. So a very small investment in fabric, $ 5.99 for the downloadable Burda PDF., about 2 hours for taping, adding seam allowances, cutting sewing just this far. 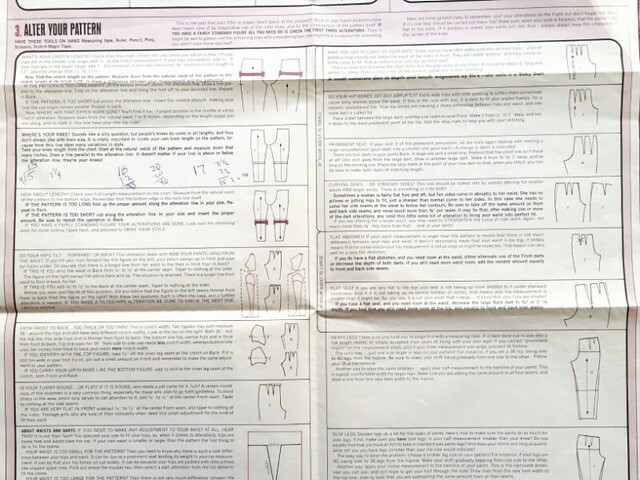 And now I will take a moment of solidarity to all those who puzzle through the Burda instructions. I never use the magazine (no way I am going to play spot the pattern piece on those sheets) and I have made a few Burda PDF's or Burda envelope patterns. The instructions are definitely minimal. 9 times out of 10 that's OK by me, I rarely look at them. But once in a while I do, particularly if there are oddball pattern pieces or the order of construction doesn't jump out at me. See above on the right side, this jacket has an underarm gusset, which in theory is fine but I didn't think it fit well and the markings were nonexistent. Now let's turn up the whining knob to 11. Something I had not noticed before on Burda downloadable patterns is that the pattern pieces are not labeled other than the number. I am just crabby this weekend because despite my constant declarations about loving summer and summer clothes maybe I am just a teensy bit sick of this weather - ready to sew and even wear a jacket or two. OK boo, hoo I should not complain about lovely sunshine but the dry weather is almost getting on our collective nerve here the way I suppose constant rain does in other places. So I had to print out that page with the key to the pattern pieces and then scrawl on them with a sharpie. See that underarm gusset, not even a dot or any good marks there. I figured it out but it made me appreciate my lovely Vogue patterns with every little dot and notch marked. I read a fair number of criticisms of Vogue patterns but so far I have never found a glaring error and do make use of all the pattern markings. There was also a mystery pattern piece which was shaped like a pointy oval, about 3 inches long and named as "insert piece neck edge" but I could not figure out what it was for. Oh well. As I said, just a bit cranky today so now that I have gotten this out of my system, crumpled it up and tossed it in the paper recycle bin I am ready to start something else. 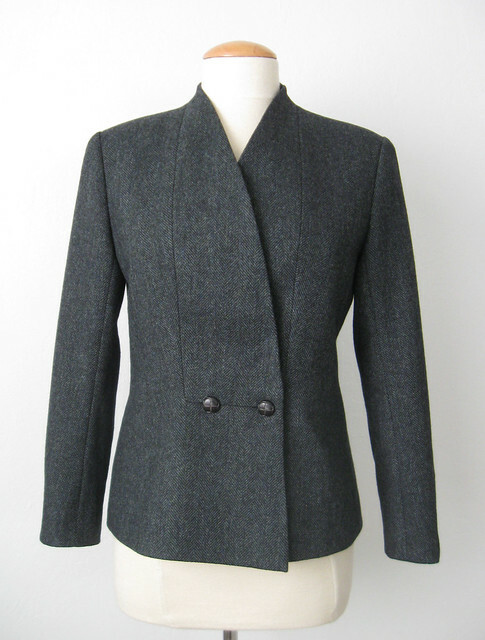 And I have made a couple of BurdaStyle downloadable patterns that I count as real successes, including the plum shawl collar coat from late last winter, and this interesting jacket in grey tweed. Love both those patterns. 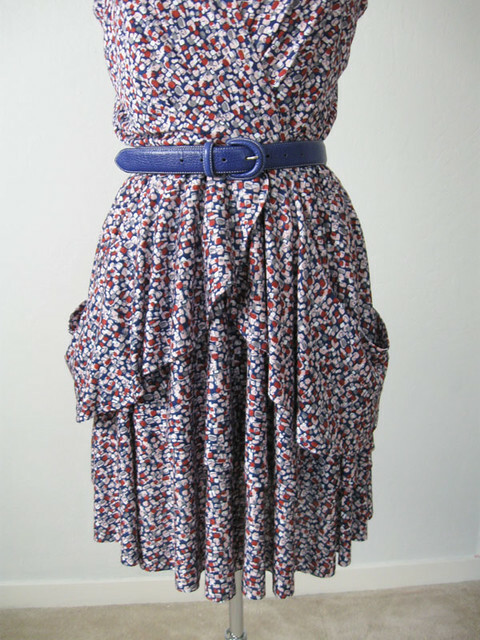 And I think the Burda Plus patterns are outstanding, I am about to make this dress again for my friend Heather. What next? perhaps as a season spanning measure I will make a blouse or two as I do have a bunch of fabrics designated for that. This pattern is one I bought a few months ago so I the next jacket I will test will be this one. Kind of simple but I did want a new basic jacket pattern that I could use for the next few years. 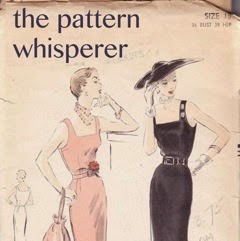 Although I suspect it might be a line for line twin of this Vogue pattern which I have made a few times. (the link goes to my final post in a full series of how I construct a tailored jacket with fusible interfacing) Noticing now that this one below is a 2-button and the older one I made previously is a 1-button. Which does make a difference. 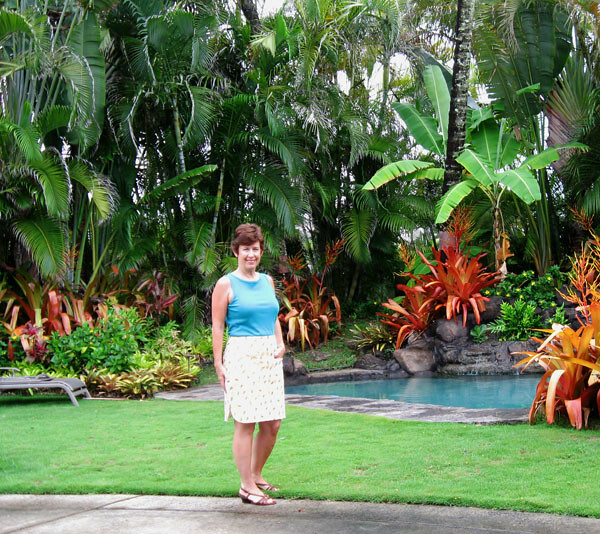 and another garden photo taken a few weeks ago in Hawaii. Good think as there is very little photo-worthy around here lately! 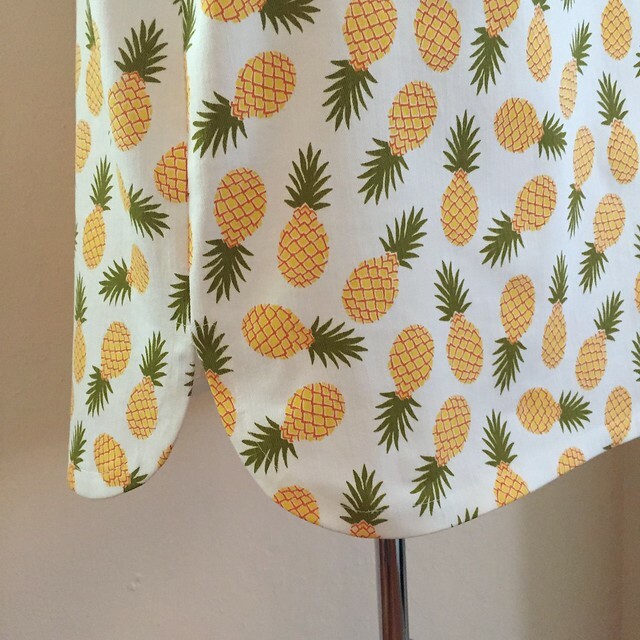 It is safe to say there are some tropical or novelty prints that I find irresistable. Particularly palm trees, or as demonstrated earlier this summer, pineapples. Also I really like Girl Charlee fabrics, they hit my sweet spot of colorful, not too pricey, lots of prints, stuff I don't see in local shops and all around cheerfulness in their array of fabrics. I do find their emails baffling, what is a Knit Fix? OK - please don't answer, I don't need to know. But I have adjusted my email preferences so that I don't get every one of their promos. I guess it is some type of sale where you get a big bundle of fabrics without choosing what is in it, and then people sell/trade for the ones they want. I suppose it works well but I don't need to get any fabric suprises, the stuff I already have is enough of a suprise. Evidenced by me looking at my fabric closet and wondering when I ordered that and what the heck was I thinking of making? To get to the point - I ordered a number of things from Girl Charlee over the summer and have sewn up about half. They are pretty much summer fabrics,(** see footnote) or at least not fabrics I would choose in winter. So the remainder is put away for next year and here are the results for the ones I did decide to cut into. That photo appeared on my Instagram during the SewPhotoHop and got a lot of love. 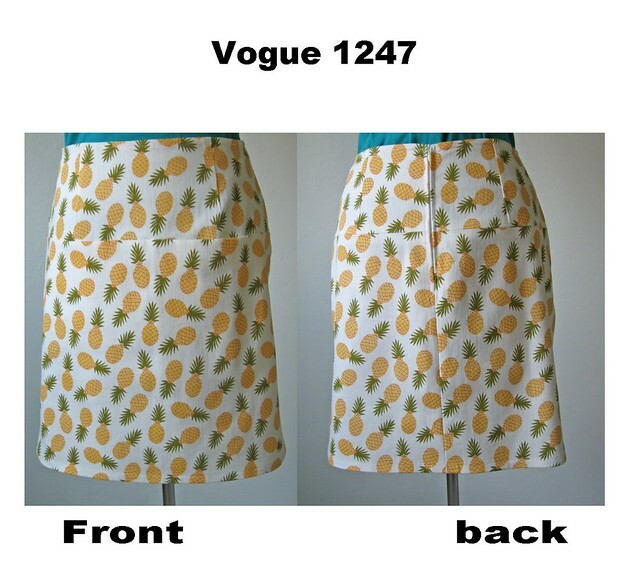 It is my beloved Vogue 1247 with a little modification to the hem because it seemed a little plain. As plain as a denim skirt covered with dancing pineapples could be. This photo is a little bright and I did not wear my shirt tucked in but wanted to show the V1247 in all its splendor, ha ha. Here it is on is the dress form. I did lengthen the pattern as I usually do, and then also made it with my "no waistband" modification. Just cut a facing using the top of the skirt. I like a clean finish at the top of a skirt with no waistband, also then it doesn't come up so high at the waist. Although in that photo above it does - I think because that top is kind of a bulky knit. another reason not to tuck in. I have now made this pattern 4 times with no end in sight. Here is the link to my first "no waistband" version with all the details. A key to that turning out well is stabilizing the waist, and I don't think a seam binding is enough, needs some interfacing. Second item in my summer of Girl Charlee is this tunic top I made for my mom. 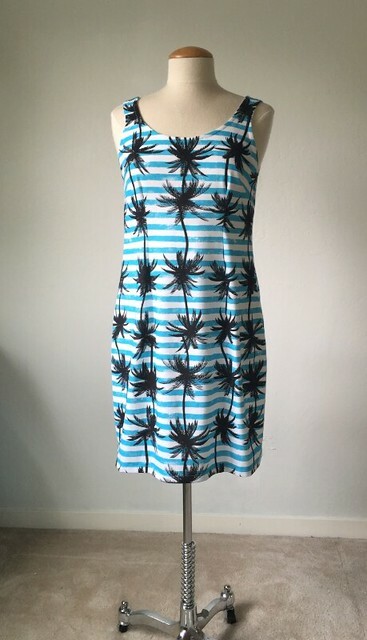 I saw these black and white palm tree prints all over this spring and summer in the fashion collections so I was really happy when I saw it on their website. This fabric is a rayon woven and I was pleasantly suprised at how nice it is. Sews beautifully. I did pre-shrink. Very light and floaty but not see-through. 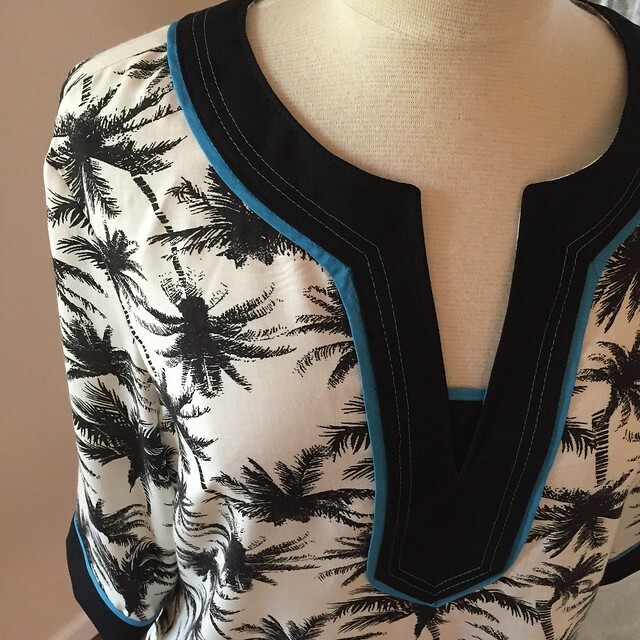 I also did a 2-part post on Craftsy which details exactly how to make a tunic top from a shirt pattern - which I think is good - if I do say so myself :) So if you are interested in creating a tunic top pattern here are the links to part 1 and part 2. I love a good black and white item but somehow needed the proverbial "pop of color" so I used bias tape to make the edging. And glad it did, it just needed an extra something. Also it was slightly too low cut so I added the horizontal piece in the center of the V, which we will call a design element! Peek at inside because everyone likes to see that. I sew the sleeve edges on from the inside, flip to the right side and then topstitch down, which results in a nice clean finish on both sides. I think all that is described in the Craftsy posts. Now last and perhaps least. 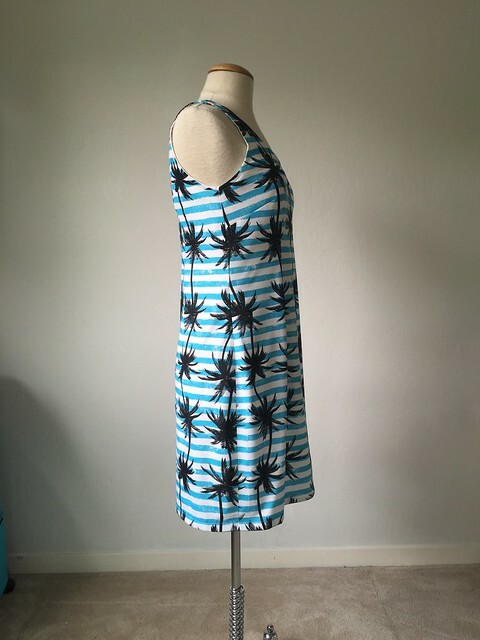 I am not going to model this one - you will have to take my word that it fits and works well as a beach dress/swimsuit coverup. But maybe this fabric is just a little bit weird. I'm showing you the side view because look how nicely I matched the stripes on this weird fabric. 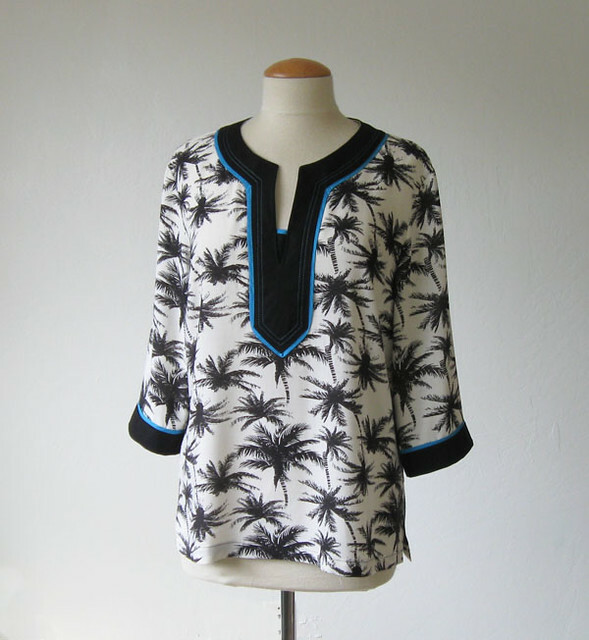 and even thought it is a beach coverup I still made a neckline facing - using some recycled white t-shirt fabic. Because on a lot of knits using bias tape is too stiff and just gets misshappen. Plus facing is just as easy (easier to me). and then lastly - a closeup shot. I looked at this fabric for quite a while before I cut it out and decided that it didn't have an up or down. 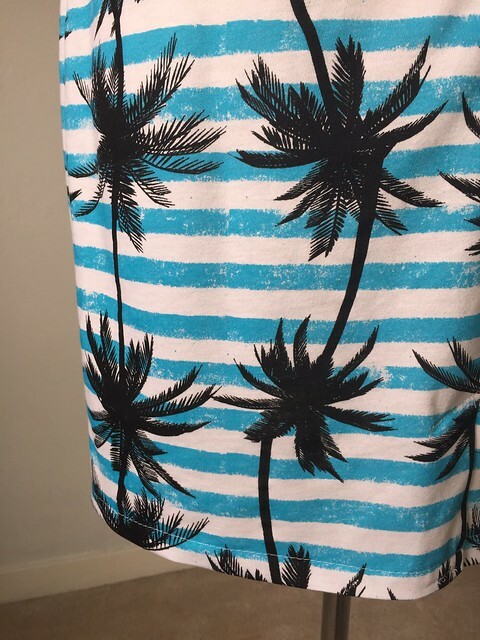 THEN sitting on the beach watching the palm trees wave in the tradewinds I realized that yes - this fabric does have a vertical direction. and I got it wrong! so now I feel like they look like spiders, not palm trees. Oh well............pass me another mai tai. Mentioning Girl Charlee again, my previous dress was their fabric also. And thank you everyone who commented on that dress. I appreciate that you have my sewing satisfaction in your hearts. And will say that I don't feel as bad about the dress as I think was perceived. I do like it and I think it is one of those things that looks much better in person, the colors look better and the skirt moves nicely. The hem is a bit long and uneven but as I said, that will be dealt with come springtime. Quite a difference of opinion on the pockets - some said to get rid of them. Noooo! 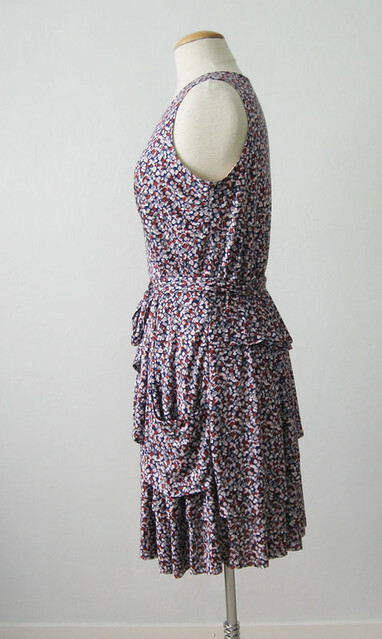 the pockets are maybe the best part, love a dress with interesting pockets. ** Footnote. I called the stuff we sew Fabric. And always do a double take (auditorially) when I hear Tim Gunn say on Project Runway "what are you planning to do with that Textile?" Do they never say fabric in the academic side of the fashion world? It just sounds funny to me and I wondered if anyone else noticed it. Speaking of TV - well I am speaking of it. I LOVE the British Baking Bee which is airing on PBS here now. I could have watched it on YouTube I suppose but it's just easier to watch weekly and then I can catch up with friends/family members who like to chat about it. NO spoilers please. and No idea which season it is. But WOW the stuff they have to make is so difficult, and in the time allotted. I am so nervous for them watching it. and hungry sometimes. anyway - a fun diversion. Onward to new things grabbing my attention. 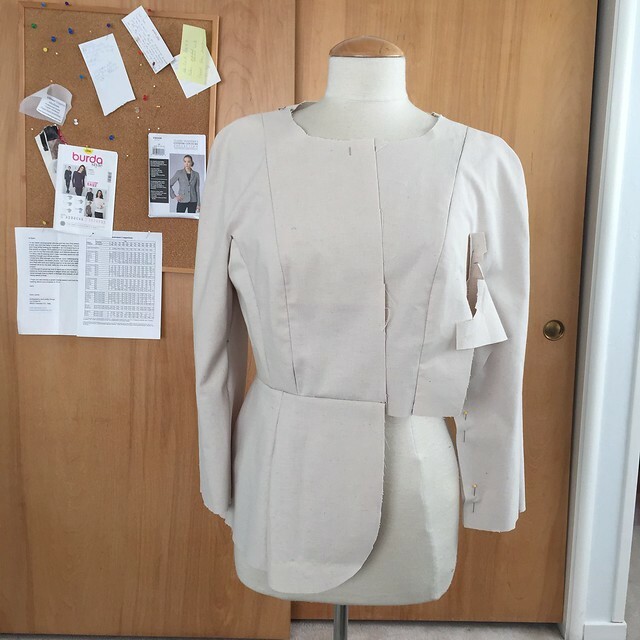 I just taped together the pdf of a Burda jacket mentioned recently. And about to start on a dress for Heather using some of her Mood Fabrics. 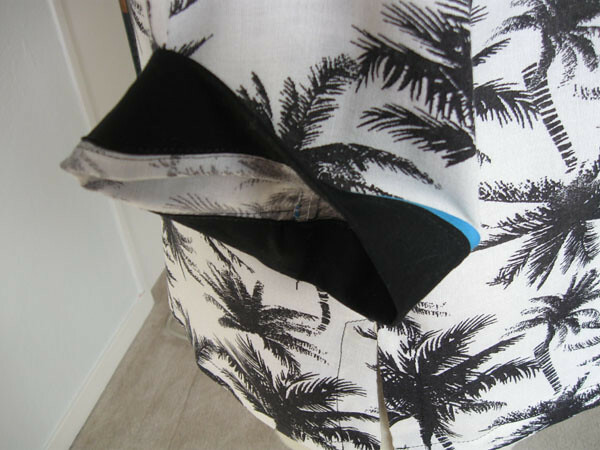 Using a Burda envelope pattern which I have never seen sewn up - for a wrap dress that has a difference and I can say Burda LOVE! Highly recommend. Burda 6946. Expect raves when I post. Great pattern. 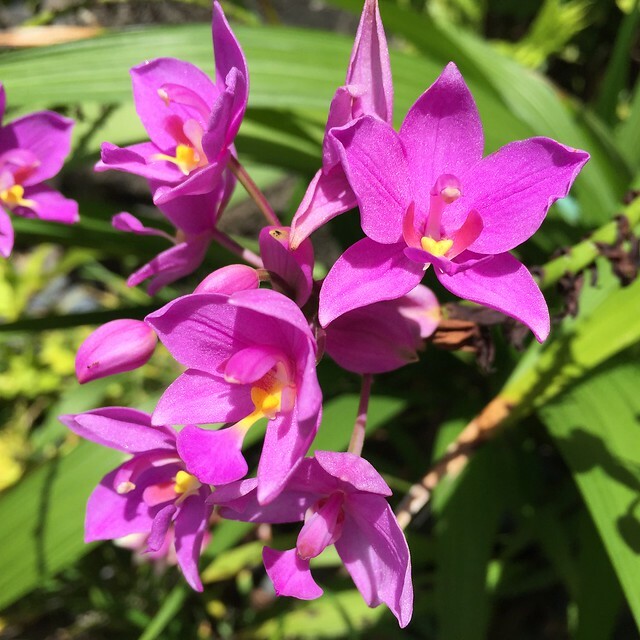 garden photo is from Hawaii. Hmm.....I have doubts. On this one. Which is so unusual for me. Maybe its the fact that I sewed up this dress just as autumn is tiptoeing into the area - although today it was around 88˚F, a shorts and t-shirt kind of day so what am I talking about? For some reason when this pattern was released I was instantly drawn to it and just had to sew it up this summer. 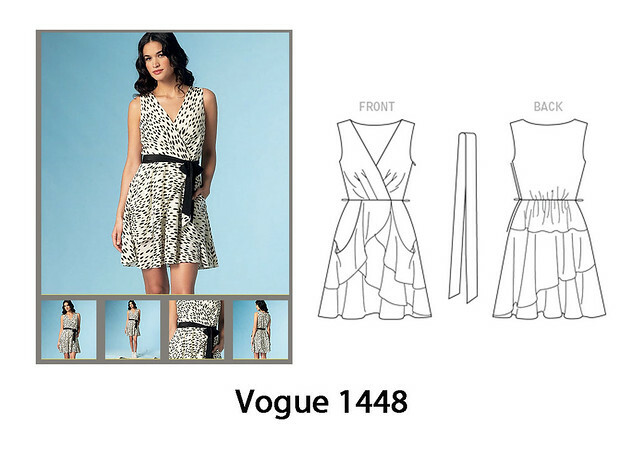 Vogue 1448, a DKNY design. So I did, and now I have doubts. Which is a rare thing for me. Usually I know exactly what I am making and either like, really really like or absolutely love. I wonder what it is about this dress? Another thought, typically when I sew a new pattern I can visualize where I would wear it. Casual clothes - no brainer. A more formal dress - ready for a party invite. Classic blazer - wear all winter long. But while I sewed this one I just couldn't picture where I would wear it. and a little caveat - I took these photos in my sewing room with the camera timer late one afternoon in a fit of uncertainty. So maybe just a little awkward? Also I lightened them up a bit because of the afternoon shadows and now my skin looks weird. One reason is fabric choice. And I'm not sure if it's the fabric in general, or the choice of this fabric with this dress. Looking at the fabric I do like it, but it's a bit muted for me. In a top to wear with jeans or something it would have been good. 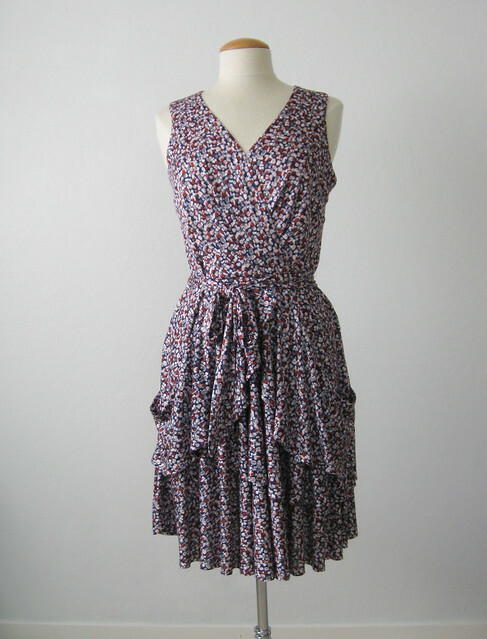 This dress is a fabric hog, it takes 3.5 yards of 60" for size 12. That is a lot for a dress for me - I can usually get a sleeveless dress for my not tall frame onto one yard or so. Consequently I ordered some fabric from Girl Charlee to use. Total fabric investment about $ 18 so I can't complain there. But that should have been a hint - that I was willing to sew it up - mostly for the fun of seeing how it all went together - but not willing to splash out on a $10 - $20 yard fabric. How about some details? Here is the dress on the form. I had to do some adjustments to get a fit on the bodice and am quite happy with those adjustments. But this is one of those dresses where I think a lot of people might be unhappy with the final fit if no adjustments had been done. Details below. and back view. With the self-fabric belt tied a bit snug on the dress form so you can see that it is supposed to blouse above the back waist. There is actually elastic just at the center back waist to pull it into the body. Ok let's get down to the fitting details. I did make a muslin of these two pieces - that's all I needed. That skirt would fit in any case so I just used some white knit fabric I found at a garage sale for the bodice parts. 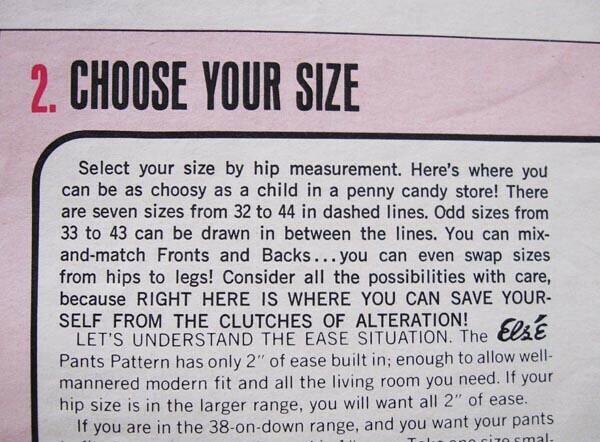 Firstly, I used a size 12 and tapered to a size 14 at the waist, which was unnecessary. Since it is gathered at the waist I ended up removing that at the waist. Reduced the center back by about 1 inch at neckline tapering to about 3/8 inch at waist. When I cut it out I added back a tiny bit at the top so more like 3/4 inch. Shortened the back waist length by 1/2 inch. Usually I take away more here but I didn't want to eliminate the blousing at the back waist. Adjusted the wrap portion at the center front, changing the straight line to a curved one which adds a bit a the center overlap, I like the front to have a bit of a curve this way and find it makes any wrap much easier to wear. Had I not done this it would have been very low. As a lot of these Vogue designer patterns are. Maybe if you are a 6 foot tall glamazon it works but not on short me. Raised underarm by about 3/4 inch. Maybe I have short arm depth? Is that a thing? 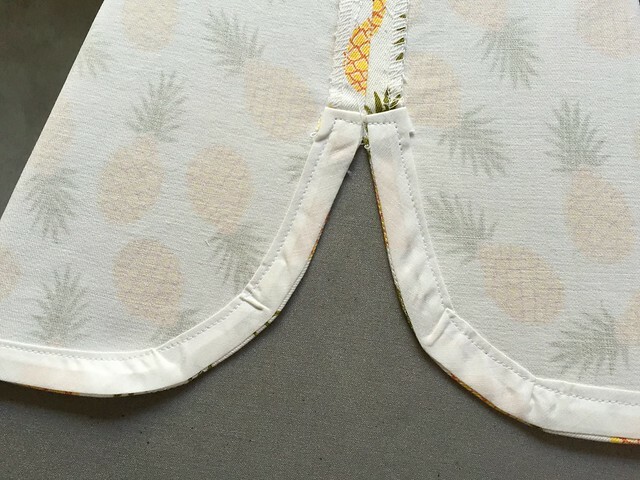 or is it the armholes on these patterns? probably a combo but I find on a lot of the Vogue patterns if I raise the armhole it is much better, and if too high it is easy to take away. Here is the pattern envelope photo and technical drawing. Now looking at it again perhaps it is veering close to a ruffle. I am not super into ruffles. 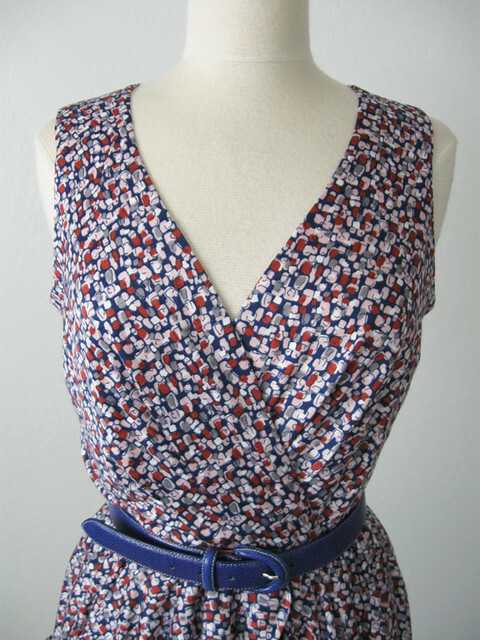 Although a nice flounce - that I do like, as evidenced by this Pauline Alice pattern sewn earlier this summer. But a ruffle skirt just seems a bit prairie girl dress. On the envelope it looks better. I think the example is a chiffon or very lightweight fabric. Although the skirt is not lined - so the double layer of the fabric has to do some work to make it, shall we say, ladylike? I have no complaints about these clever pockets, though. They are hidden in the ruffles and droop a bit on the dress form but as worn are smooth and don't stick out. Oh, another thing - this dress is not hemmed and I think on anyone taller it would be quite short (another typical Vogue designer thing). I figured the flounces didn't need hemming either, as this is a jersey knit and they are round so all bias edges but actually kind of disappeared on the skirt without any hem. The small stitched hem was enough to make them show up so that is something to keep in mind. and a look at the bodice. Featuring my blue leather belt which lives in the sewing room. Kind of amazing how many of my creations that it matches, which might say something about my restricted color palette. Or that blue goes with anything :) This fabric is a navy blue background with little pink, grey and magenta abstract spots. The bodice is lined with knit fabric. There is info on knit linings in my recent post. See, kind of odd from the side. Also I thought it was a bit strange that the ruffle things didn't match at the side seams. And I know I didn't sew it wrong so that was the design. Here's one with the belt instead of the self-fabric tie. I actually like the belt, maybe it makes it a bit less girly? which is not the intent. Ack - I dunno. Anyway this is going into the closet with the other summer stuff and we will give it a try next spring. This is my favorite picture of the day. 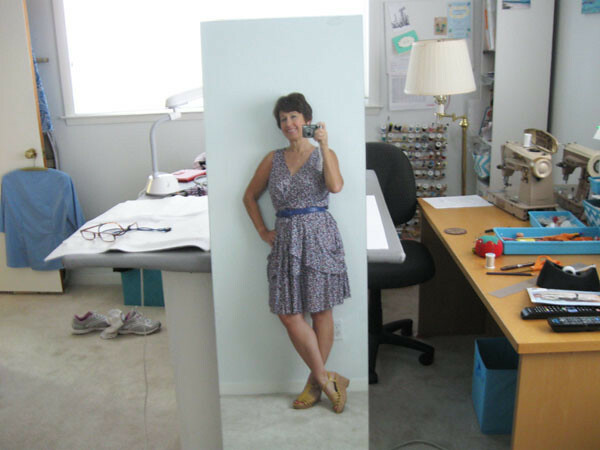 I rolled my sewing worktable across the room so I could stand against the blank wall and take a mirror shot. Forgetting that everything behind the mirror is also in the camera's view. So real life sewing room, or portion thereof. including my Singer Rocketeer which everyone seems to notice in pictures. iPad on the table because who can sew without constantly checking up on the sewing blogosphere. Sneakers discarded, a muslin of Sewaholic Alma blouse hanging on the door which I am sewing for someone else. My very ugly floor lamp which I usually hide if anyone comes over but it takes a 3-way bulb so nice and bright. TV remotes on the desk because if not listening to podcasts then catching up on TV. The teal blue trays on the desk which are super handy for keeping all my tools in and then I can move them around the room. And most importantly my glasses because you know, sewing. So that's the latest. I think I had better make a hard right turn into Fall Sewing. One of these days around here it will be frosty in the morning and thus turtleneck + boots weather. Not that I want it. Just tolerate. However if we have a nice rainy winter I will be thrilled. Happy weekend sewing - and be careful as there are a lot of desperate folks (read non-sewers) on the hunt for Halloween costume fabrics this month. For my garden photo today - speaking of desperate - it is so dry, even the trees are starting to look a bit exhausted. I am worried about the lemons and hope we get a good drenching soon. 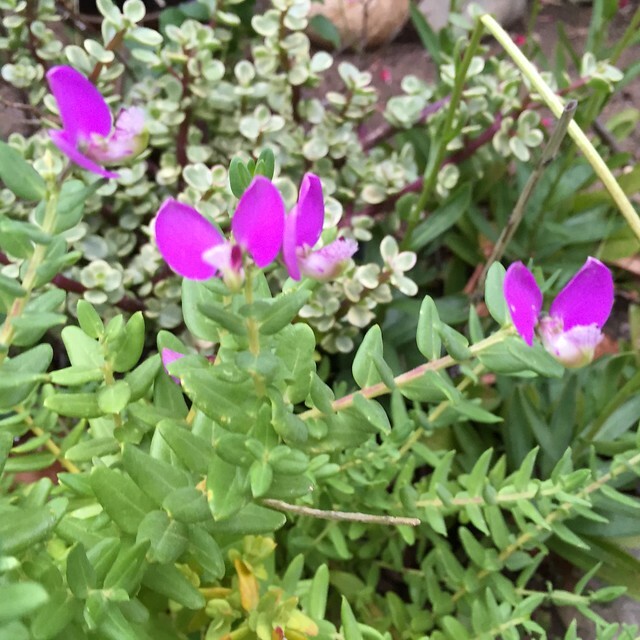 So how about a succulent - although I'm not exactly sure what this is. The plant in the background is definitely a succulent though.